Over the Rainbow: It's a GIVEAWAY! Hello, bloggy friends! As you read this, I will be enjoying sunny Florida, and hopefully not getting caught in a hurricane. But while I'm out, I preposted several posts for y'all this week, including this fun giveaway! The nice folks over at My Memories contacted me to offer a free software giveaway to one of my readers! While I'm not a digital scrapper myself, I hear the product is easy to use, and I'm in love with the layouts scrapbooks star Megan Klauer created with the software! And that's not all--aside from the lucky winner, EVERYONE can receive a $10 discount for the My Memories Suite Software and a $10 off discount for the My Memories store with the code STMMMS95349. 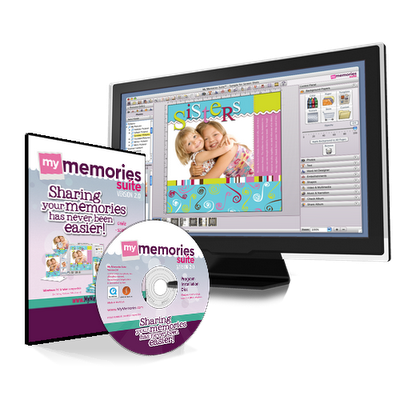 If you'd like to make a purchase, follow this link to the My Memories Suite Software and store. Th rainbow wishes pack is adorable!